Most folks who read this blog don't have monkeys in their yard very often. We didn't, either, until just a couple of years ago. This is sign that the forest habitat in our vicinity has improved dramatically. Howler monkey ranges have expanded, and so have monkey populations. 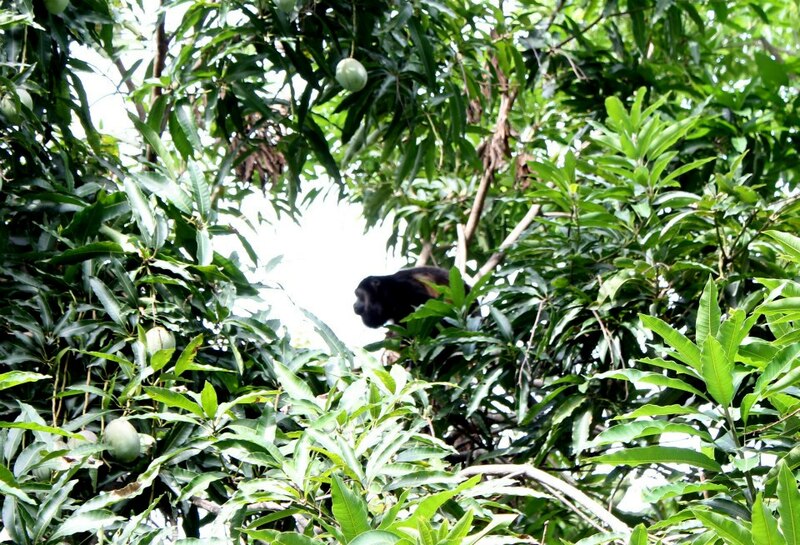 During the year 2012, howler monkeys have been in our property more days than not. Here are some excellent photos taken by students of Apoyo Spanish School recently. He's looking at you! A male howler monkey watches over the folks at Estacion Biologica. Photo by Summer Bush. This monkey can make a lot of noise. Photo by Summer Bush. 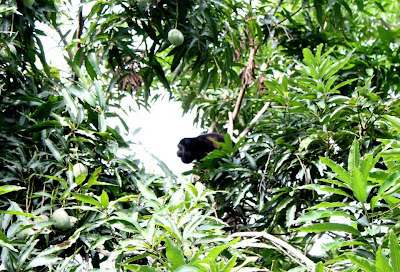 Ripe fruits such as mangoes attract the howler monkeys to come near to people, but not too near. Photo by Summer Bush. Sometimes, the monkeys come quite close. Photo by David Rusling. Until about four years ago, howler monkeys did not come into the trees overhead at Estacion Biologica often. But something happened-the trees on each side of the access roads in Laguna de Apoyo Nature Reserve grew until they linked the land on each side of the road. Howler monkeys never come down from the trees to touch ground, so their movement is limited by the connectivity among trees. The monkeys today enjoy the vastly increased accessible habitat, thanks to the increased connectivity in the reserve. And we enjoy watching them. Howler monkeys are not particularly fast or agile, but they do swing, hang by their tails, and occasionally, leap from one branch to another. Not only do we watch them: they watch us, too, often with suspicion. 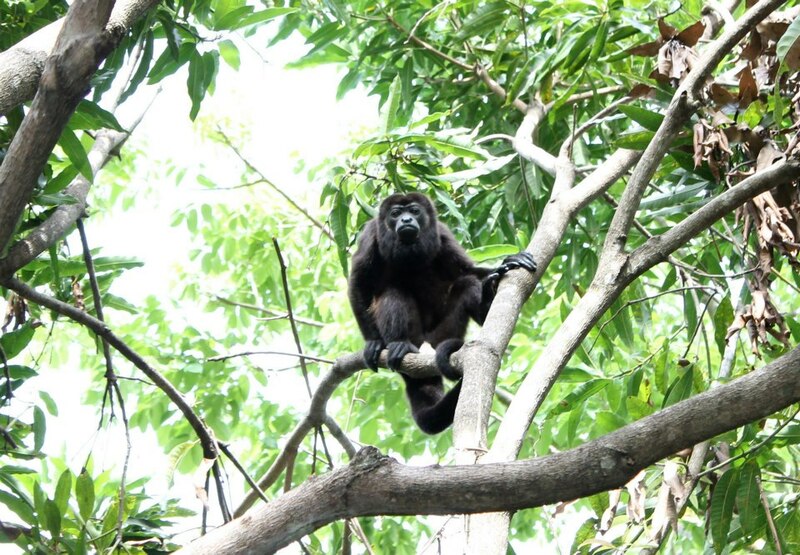 The howler monkeys don't like humans much. Hanging by the tail! Photo by David Rusing. 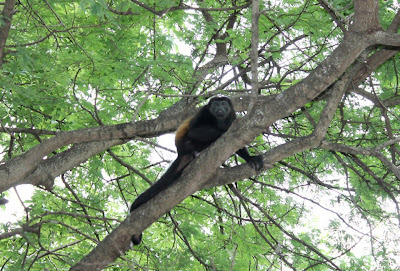 Howler monkeys eat fruit, when it is ripe, and lots and lots of leaves, especially the finer, newer leaves. They don't need to move fast for any of their diet, but they might need to react against a potential predator such as a cat. It seems that they don't care much for the White-faced capuchin monkeys, either, for we see them in proximity very rarely. Squirrels and most birds, however, do not have any issues with the monkeys. 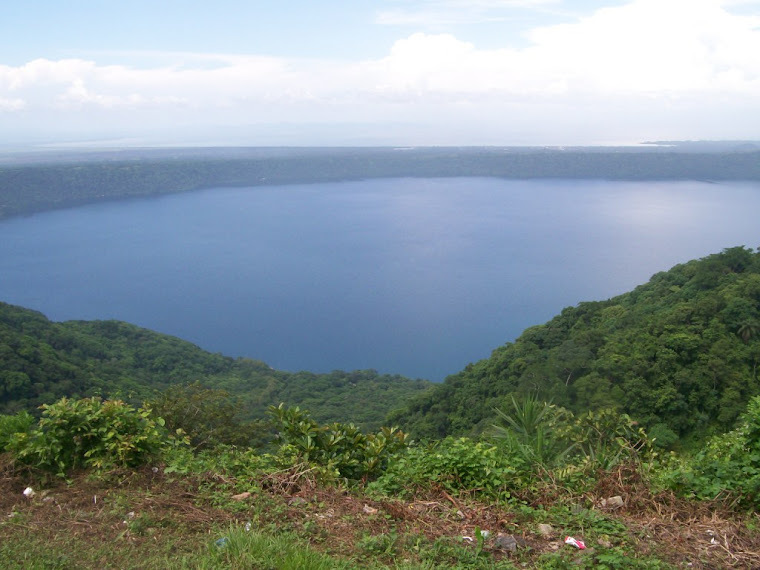 FUNDECI/GAIA conducts research and conservation actions in Laguna de Apoyo Nature Reserve, with the intention to protect the howler monkeys and other wildlife found here. Please consider working with us as a volunteer, researcher, or donor. You can help in many ways.